An international law subtext dwells just beneath the surface of the U.S. Supreme Court's order to release tens of thousands of California inmates. That order came Monday, in the Court's 5-to-4 decision in Brown v. Plata. 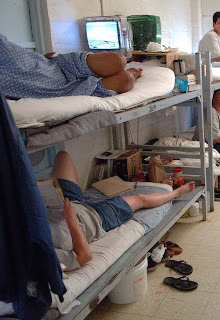 In his opinion for the Court, Justice Anthony M. Kennedy held that the physical and mental health care California provides to its inmates is so deficient that it constitutes cruel and unusual punishment in violation of the 8th Amendment to the U.S. Constitution. subject sick and mentally ill prisoners in California to 'substantial risk of serious harm' and cause the delivery of care in the prisons to fall below the evolving standards of decency that mark the progress of a maturing society. The medical and mental health care provided by California’s prisons falls below the standard of decency that inheres in the Eighth Amendment. Regarding this disagreement, Scalia cited his 2005 dissent in Roper v. Simmons. Simmons, of course, was the decision in which a majority of the Court overruled precedent to hold that the 8th Amendment forbids the execution of persons who were children when they committed murder. Its reliance on "evolving standards of decency" -- a formulation that, as I've written, derives from Weems v. United States, a 1910 Supreme Court opinion respecting the then-U.S.-held Philippines -- invited consideration of transnational as well as national norms. In Simmons the majority explicitly consulted such norms, found in, among other sources, the Convention on the Rights of the Child. That reference provoked sharp dissents from members of the Court, not to mention threats of impeachment from some members of Congress. Since its issuance of Simmons in 2005, the Court has remained notably silent with respect to foreign and international sources of law. Yet the muted exchange between Kennedy and Scalia in Plata speaks volumes about the degree to which this controversy continues to burble just below the surface of published opinions.